Most birds of prey are exactly that, birds of prey. There are those which are primarily fish-eaters, like the osprey (Pandion haliaetus) and fish eagles (Haliaeetus spp. ), but they are still technically carnivorous, preying upon fish which they catch themselves. 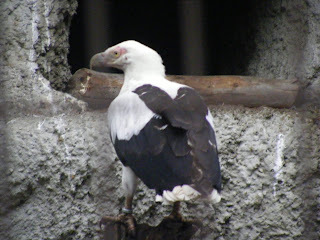 There are also those, notably vultures, which rely mainly upon carrion (these are the Old World vultures of the family Accipitridae, not, I repeat, not, the condors and American vultures of the family Cathartidae/Ciconiidae, which are more closely related to storks than other vultures). One vulture, however, is a maverick, being almost totally vegetarian. Meet the palm-nut vulture, a black-and-white bird found in most of Africa below the Sahara Desert. Crucially, it is found only in close proximity of its favourite food source, the oil palm (Elaeis guineensis). Oil palms are notorious in topical environmental conversation: humans exploit the palm for the fat-rich fruit for use in cosmetics, food and as biodiesel. The vultures, however, just eat the damn things. Palm-nuts make up the majority of this bird's diet, which it supplements with carrion, like other vultures, and have been known to catch fish in the wild. Interestingly, captive birds have been fed on meat, but prefer palm nuts when offered them. 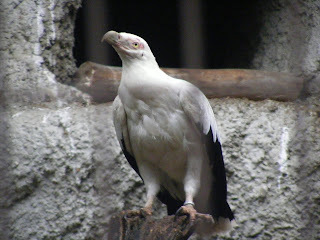 This suggests that the vulture in the wild would be an adaptable bird, only living on palm nuts because they are plentiful; should there be a deficit of oil palms, for example because of deforestation, the birds could change their diet accordingly, either to other plant species, or to meat, fish or carrion. Vultures the world over are well known for having bald or almost bald heads, supposedly to prevent feathers becoming caked in blood. The palm-nut vulture has a reduced area of naked skin just around its eyes.